Let’s use different base-height pairs to find the area of a triangle. Draw one triangle with an area of 12 square units. Try to draw a non-right triangle. Be prepared to explain how you know the area of your triangle is 12 square units. Here are three copies of the same triangle. 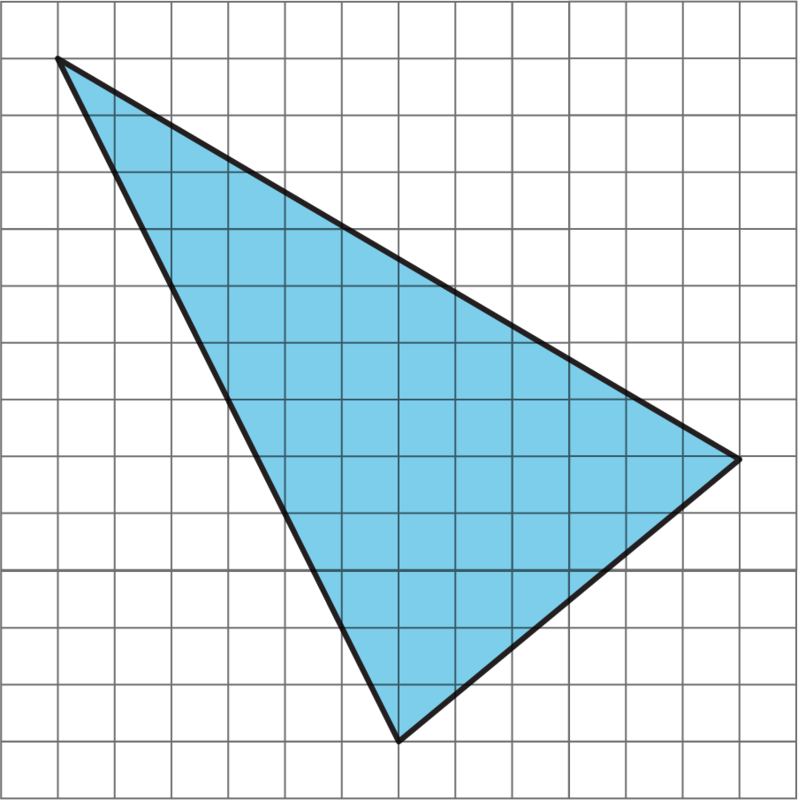 The triangle is rotated so that the side chosen as the base is at the bottom and is horizontal. Draw a height that corresponds to each base. Use an index card to help you. Pause for your teacher’s instructions before moving to the next question. Draw a line segment to show the height for the chosen base in each triangle. For each triangle, identify and label a base and height. If needed, draw a line segment to show the height. Find the area of the triangle below. Show your reasoning. 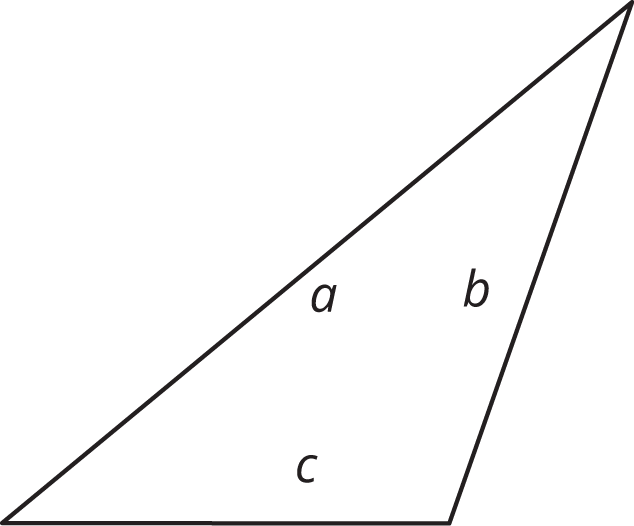 A height of a triangle is a perpendicular segment between the side chosen as the base and the opposite vertex. We can use tools with right angles to help us draw height segments. 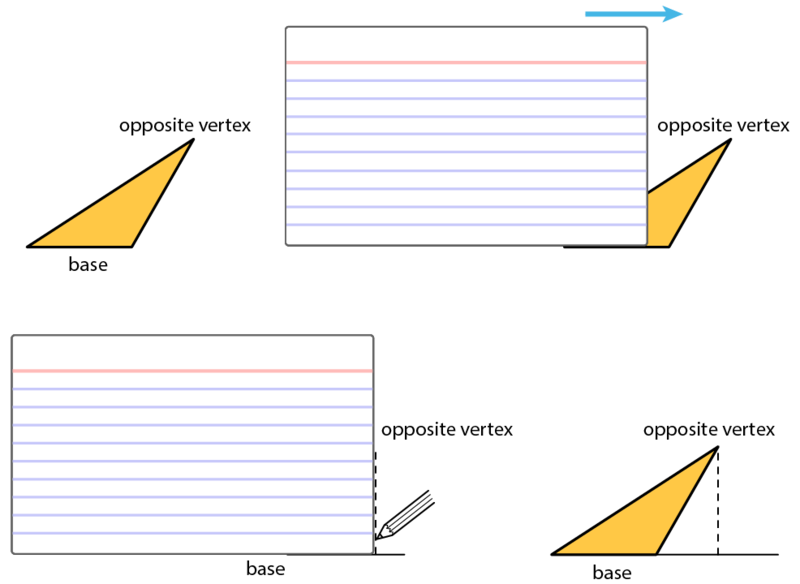 An index card (or any stiff paper with a right angle) is a handy tool for drawing a line that is perpendicular to another line. 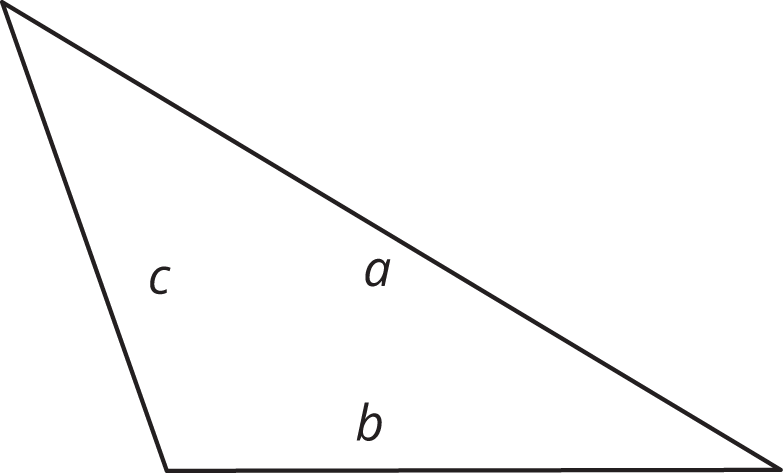 Choose a side of a triangle as the base. Identify its opposite vertex. Line up one edge of the index card with that base. 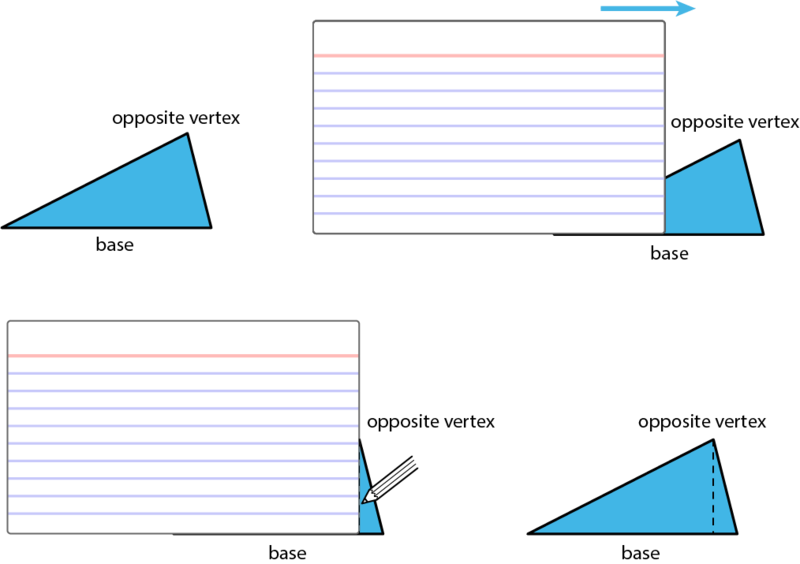 Slide the card along the base until a perpendicular edge of the card meets the opposite vertex. 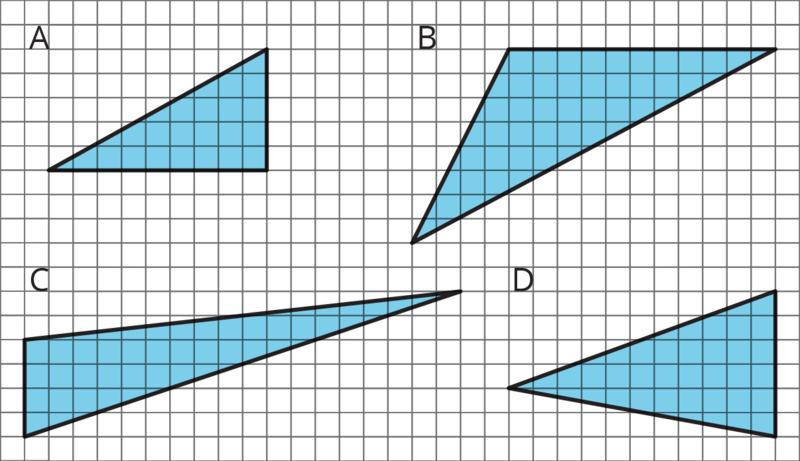 Use the card edge to draw a line from the vertex to the base. That segment represents the height. 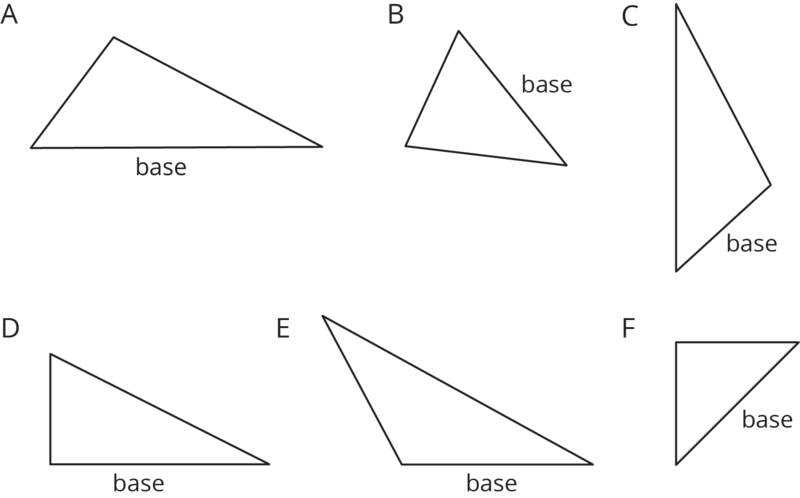 Sometimes we may need to extend the line of the base to identify the height, such as when finding the height of an obtuse triangle, or whenever the opposite vertex is not directly over the base. In these cases, the height segment is typically drawn outside of the triangle. Even though any side of a triangle can be a base, some base-height pairs can be more easily determined than others, so it helps to choose strategically. For example, when dealing with a right triangle, it often makes sense to use the two sides that make the right angle as the base and the height because one side is already perpendicular to the other.